Rally-O (also know as Rally Obedience) emphasizes fun and excitement for the dog/handler team while providing an interactive approach to obedience. Rally is about the most fun you can have doing obedience exercises with your dog! The exercises involved in the course will help build your skills as a handler and increase your dog’s repertoire of behaviors. Praise, encouragement, and continuous communication are encouraged in this fun sport. We encourage novices new to the sport to sign up (your dog should be responsive and know basic obedience to begin learning Rally) as well as those that have practiced the novice movements and are ready to move on to new challenges. A rally course consists of different numbered stations that are advanced to in order. A sign at each station gives instructions to the dog-handler team, and each team must execute the station’s particular task within two-to-four feet of the sign. Once the judge gives the command “forward,” the dog and handler complete the course on their own without further commands from the judge. Handlers may not use treats or toys in the ring, but may do anything else to encourage their dogs at the novice and advanced levels except physically touch them or make corrections with the leash. Encouragement is allowed at the excellent level but handlers cannot pat their legs or clap their hands as they can in novice and advanced classes. 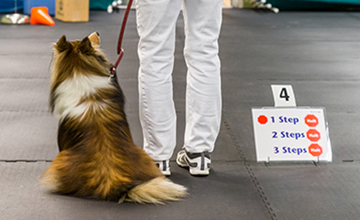 Signs instruct teams to go fast or slow, to halt (dog must sit at heel), to make turns and circles, to reverse direction, to do a sit-stay-recall, or to follow other basic obedience exercises. Rally is also a great sport for anyone doing Agility with their dog as well. It helps create a better working relationship and partnership and your dog learns to look to you for direction. This is Rally Advanced and Novice combined. This is a mixed level class working on negotiating a different Rally course and skills eash week. There will be two choices of signs, one for more novice students and one for more advanced. You can choose which sign you want to work on at each numbered station. This class is held indoors. The classes are an hour a week for 6 sessions. Drop ins are available if there is room in class. The fee is $28.00 per session. How does a mixed-skill class work? In this class, by offering a choice of Novice and Advanced exercises at many stations, students of all levels will learn, improve and have fun! For any Rally class, your dog must be good around other dogs and people. 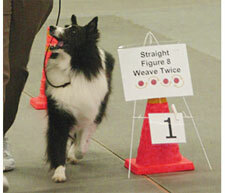 To begin the Rally class, ideally you and your dog should complete Focus Foundation or a similar obedience class. If home-trained, your dog must have a good sit and down, be able to walk calmly on a loose leash at your side, and give you attention around other dogs and people.